That would be Dappy, showing off his hashtag tattoo (hashtat?) in a selfie he recently shared. He picked up the ink to be "trending forever," though nothing Dappy-related has popped up on Twitter's list of hot topics. The best part? Dappy is best known for his song "No Regrets." We'll see how that turns out. Facebook Version 7.0 is Loaded With Features! 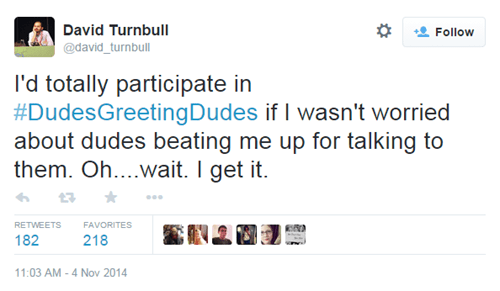 Are Catcalls and Street Interactions Still Weird if it's #DudesGreetingDudes? Writer and comedian Elon James White had a simple question in response to the Walking in NYC as a Woman video: What if dudes started greeting each other that way? I mean, it's not weird or sexual if dudes do that with one another like they do to women, right? 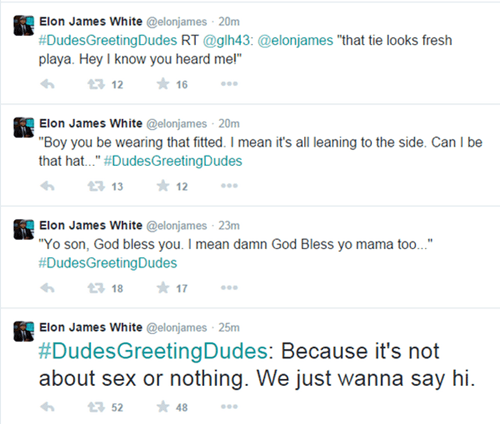 Thus, #DudesGreetingDudes was born. Check out the full story over at Know Your Meme!